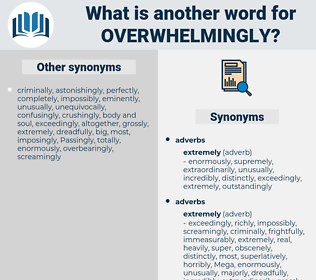 What is another word for overwhelmingly? 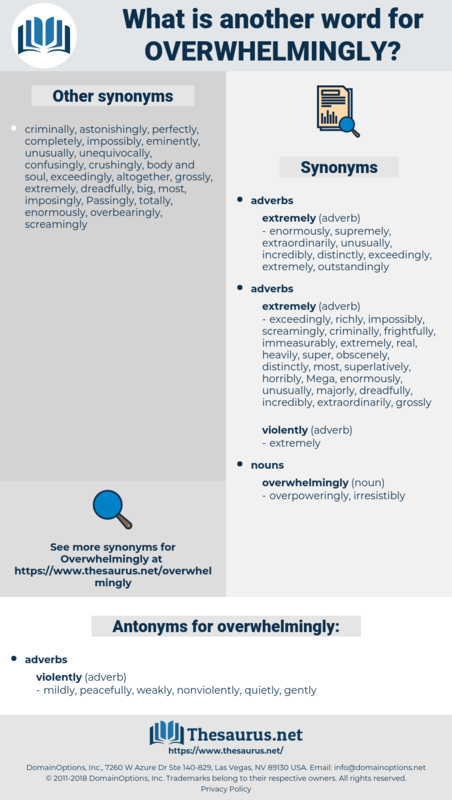 massively, largely, mostly, immensely, heavily, extremely, mainly, extraordinarily, eminently, widely, predominately, highly, unanimously, enormously, primarily, essentially, tremendously, incredibly, hugely, strongly, extensively, immeasurably, broadly, exceedingly, excessively, vastly, principally, utterly, unbelievably, overly, generally, exceptionally, greatly, absolutely, chiefly, convincingly, substantially, dramatically, grossly, significantly, emphatically, completely, definitely, critically, forcefully, inordinately, very, conclusively, firmly, crucially, basically, prohibitively, universally, entirely, intensely, decisively, remarkably, terribly, considerably, supremely, fundamentally, exclusively, drastically, severely, virtually, particularly, unequivocally, totally, categorically, disproportionately, undoubtedly, awfully, wholeheartedly, clearly, vitally, vehemently, sharply, decidedly. mildly, peacefully, weakly, nonviolently, quietly, gently. Grant me this, and I shall be Honoured overwhelmingly. Imports have overwhelmingly served the needs of production and industrial expansion.